Android smartphones and tablets can become slow and sluggish over time. These easy-to-follow tips will help make your device run like new. You may have noticed over the past few months that your once-speedy Android device has slowed down considerably. Simple tasks such as switching between apps or returning home are proving more troublesome than before, and you are now experiencing lag in all the wrong places. Things don't have to be this way, however. Your device has a limited amount of internal storage and the less free space it has the slower it will perform. If you have filled your device with photos, music, or apps, it is recommended to free up space by either uninstalling unused apps or moving files to cloud storage services like Dropbox or Google Drive. 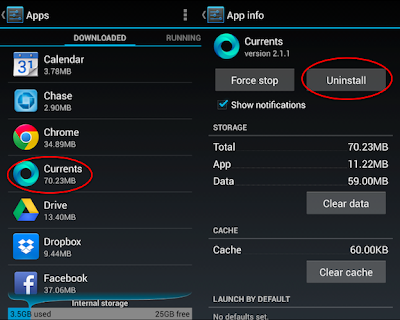 Uninstalling apps can be done by going to Settings, opening the Apps menu, and selecting the app you wish to uninstall. Preloaded applications from carriers or manufacturers that cannot be uninstalled, known as bloatware, can at least be disabled and hidden from the app drawer using this method. On smartphones and tablets that include expandable storage you can also move apps to the microSD card. To do this, enter Settings, go to the Apps menu, click the app you wish to move, and select the "Move to SD card" option. Cached data can build up over time in your applications and affect the performance of your device. Deleting individual caches can be done in the Apps menu, but a number of free programs are available through the Google Play store that can automate the process. Some of the most popular ones include App Cache Cleaner and Clean Master, both of which are available for free. Many people would argue that widgets are one of the benefits of using an Android device. They can be helpful for finding information quickly without having to open an app, but at the same time they can eat away at battery life and slow your device. Reducing the number of widgets, especially data-intensive ones like Facebook, will help your smartphone or tablet run more smoothly and last longer. You can remove widgets from the home screen by long-pressing the one you wish to delete and dragging it to the top of the screen. Another cool Android feature is the option to use a live wallpaper as your background. Like widgets, however, live wallpapers can slow down your device and drain the battery. You can also change your wallpaper with a long press on the home screen. A hidden settings option in Android will give you access to commands you may have never known existed. Go to Settings, About Phone, scroll down to Build number, and tap it seven times. You will now have access to developer options. These special settings allow you to do a variety of things, but they are meant for advanced users and shouldn't be changed unless you know what you are doing. One tweak that could speed up your device is disabling animations within the operating system. To do this, open Settings, go to Developer options, and scroll down to the Drawing option. 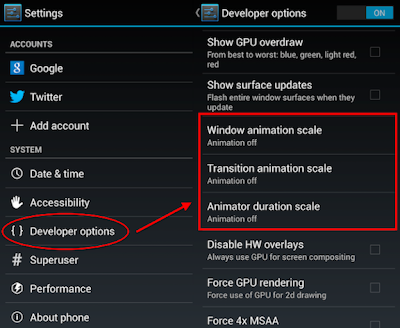 Next, turn off the Window animation scale, Transition animation scale, and Animator duration scale. This will disable animations that occur when you open, close, and switch between apps. Although the interface will look less polished, there should be less lag in performance. 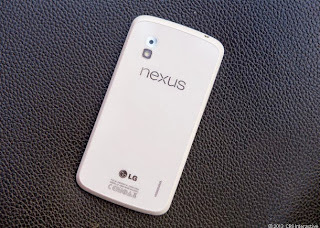 Manufacturers and carriers are continually pushing out new software updates to their devices. It is imperative that you be on the latest firmware as these updates usually include security and bug fixes, among other things that will improve the overall stability of your device. To check to see if there is an update available, go to Settings, select About Phone, and choose the "System updates" option. Risk takers and advanced users can also root their device, which will open the door to new features and even greater performance boosts. Rooting gives you the ability to overclock the device's processor, install a custom ROM, and other things; however it also voids your warranty and could cause irreversible damage to the device.